The resources that are part of the Open Data Hub Project are subject to different licenses, which are described in section Licenses for Open Data Hub resources. 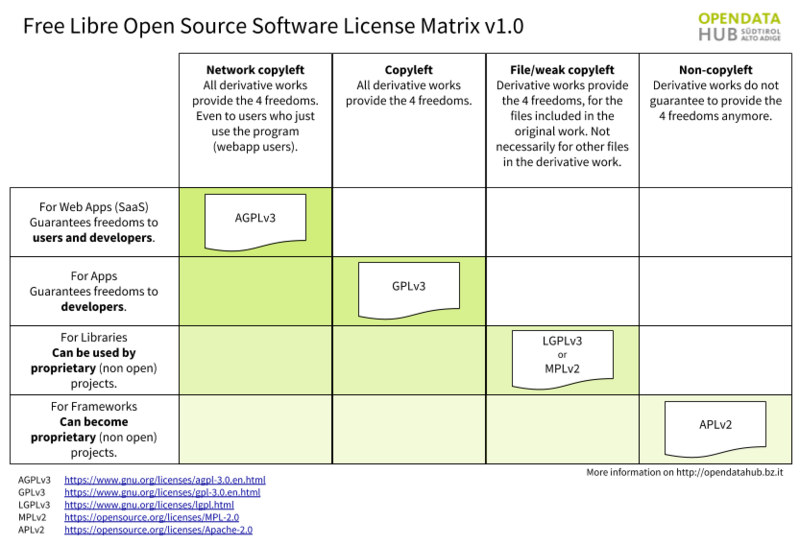 Derivative material built using Open Data Hub material is also subjected to different licenses, depending on its purpose, as shown in Figure 4.1. Figure 4.1 Licenses for the Open Data Hub and derivative material. The freedom to study how the program works, and change it so it does your computing as you wish (freedom 1).. Access to the source code is a precondition for this. According to the main goal of the Open Data Hub Project, we have defined licenses for its different components and we use badges across the documentation for a better visibility. As a rule of thumb, we try to do our best to deliver Open Data by developing Free/Open Source software and by using an Open Standard for the API used to access data. All the software released within the Open Data Hub is Free software and complies with the GPLv3 license. Datasets currently expose only open data that are in the public domain, so they are released as CC0. APIs have no license yet, since we are in the process to define which among the CC licenses could fit best. 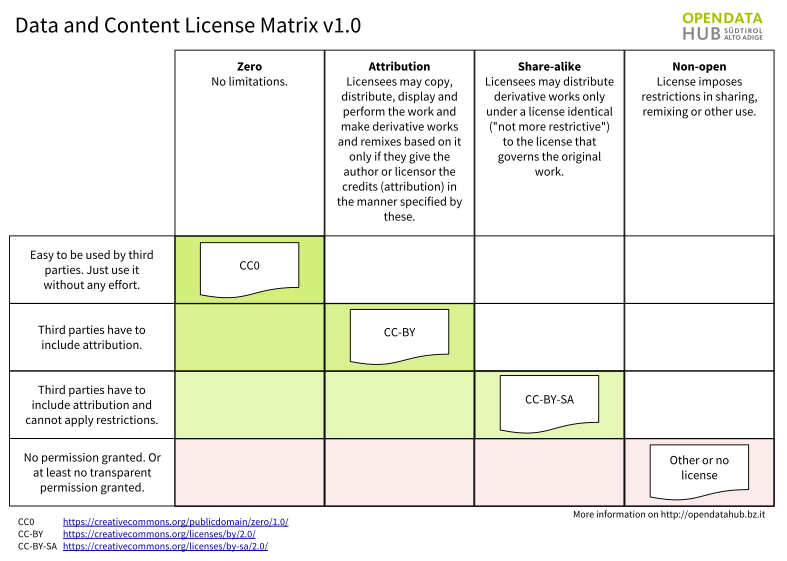 See Figure 4.2 for an overview and quick description of CC licenses and derivative material. Figure 4.2 Creative Common Licenses and derivative material. The Open Data Hub project is already used in production for IDM internal projects, and in particular it is the data hub used by the South Tyrolean tourism portal www.suedtirol.info. The public API are in early development and therefore should be still considered as a beta version. If any third party would like to use a stable version of the APIs in its production environment, a special agreement must be signed with IDM Südtirol - Alto Adige. You can contact info@opendatahub.bz.it for any information.